One of the characteristics of option trades that is particularly vexing to the new trader is the almost infinite variation in which individual options can be combined to produce a seemingly infinite array of choices. These combinations of the various individual options are more than a theoretical exercise; each individual combination often produces a unique Profit & Loss curve. We have discussed previously the concept of a calendar spread. To review briefly, a calendar spread is constructed by selling a shorter dated option and buying a longer dated option at the same strike price in the same type of option, either puts or calls. 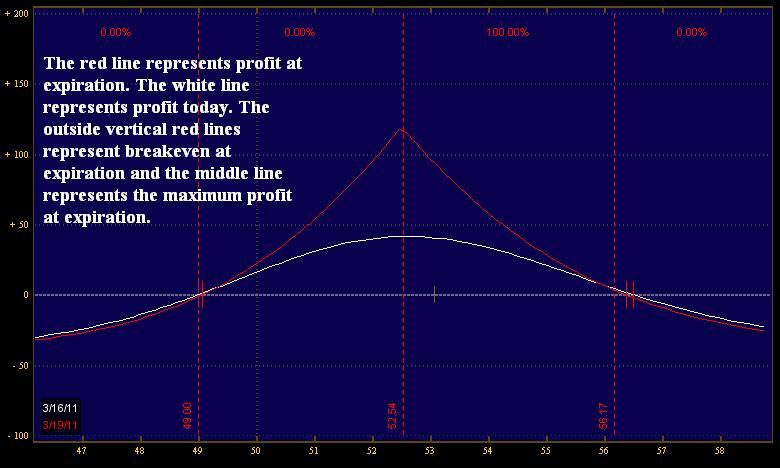 The profit engine is the difference in the decay rate of the time premium between the two options. A fundamental characteristic of options is that the time premium embedded within a shorter dated option decays at a faster rate than that contained within a longer dated option. 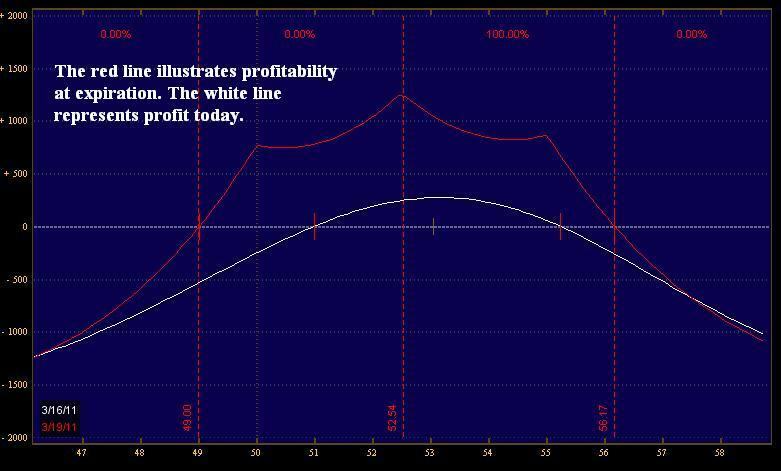 Additional characteristics of this trade structure are that the range of profitability extends over a variably broad range and the maximum potential profitability occurs at options expiration when the price of the underlying is precisely at the strike price of the calendar. Before the trader enters trades such as this, it is important to understand the pertinent risk factors. I find it helpful when thinking in terms of risk to remember that option trades must be considered in terms of the risk presented by each of the three primal forces of options: time, price of the underlying, and implied volatility. In the case of a calendar trade, the passage of time and the inevitable erosion of time premium is the fundamental profit engine. Generally, risk in the calendar trade decreases with the passage of time as more of the eroding time premium accrues to the benefit of the trade. The effect the second primal force, the price of the underlying, can be easily seen in the graph above; pay particular attention to the fact that there is both an upside and downside breakeven point and the trade must be managed with both these profitability borders in mind. Finally, the often overlooked impact of the implied volatility must be considered. This factor is the most frequently overlooked variable in the trade but is arguably the most important factor in deciding to use this trade structure. The starting point for considering this variable is the current status of the implied volatility considered within a historical framework. It is important that the longer dated options not be in the upper portion of their historical volatility range. If one were to purchase these options at the initiation of the trade, there would be a significant risk of volatility collapse as the implied volatility was to revert to its mean. This would negatively impact the trade. When considered against the light of the single calendar structure presented in the previous graph of today’s discussion, this triple calendar has a significantly higher probability of success- 82% as opposed to the 55% of the single calendar. At the moment, early in the final week of the March options cycle, the position is profitable at a bit over 20% of invested capital. I consider this to be an excellent result for two weeks in a high probability trade. For long term survival as an options trader, life is much easier with these sorts of high probability trades which deliver solid returns on invested capital. Swinging for the fences is more exciting, but the lives of successful option traders consist of singles and doubles. These hits add up over time to deliver a robustly growing equity curve without the sleepless nights of the home run hitter.